Chicago Scene Presents a cultural exploration of live music by premiering THE WANDERING Fort Knox Studios and Vicarious Venues, ChicagoSCENE is proud to present three compelling local bands in the first of the series at the Godfrey Hotel Chicago, 7 p.m. to midnight, March 26. As it travels throughout various venues, the series is also a contest that provides a strong career boost for up-and-coming acts in the music rich city of Chicago. ChicagoSCENE , Vicarious Venues and Fort Knox Studios bring the first ever concert to IO Urban Roofscape at The Godfrey Hotel. This program is designed to blend some of Chicago’s best up-and-coming talent while taking in a panoramic view of our beloved city. Guaranteed to be Chicago’s hottest rooftop lounge, IO Urban Roofscape offers more space and unique amenities than any other venue in the city—retractable roof, video wall, shimmering water elements and more. You need to check it out The Godfrey Hotel| IO Urban Roofscape. 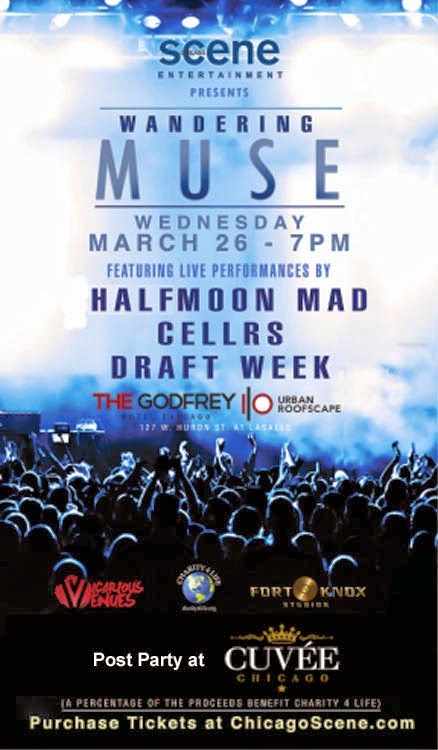 The Premier Wandering Muse event will feature live performances from: Draft Week, Cellrs and Halfmoon Mad.